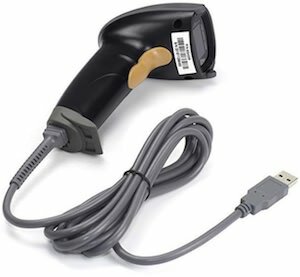 If you need to scan lots of barcodes then you should check out this USB Barcode Scanner. A barcode scanner does not have to be expensive and that is good as it will ad so much functionality to your life. All products have barcodes and you will be easily to scan them by just plugging this scanner into your USB port. You don’t even need software as it will work just like a keyboard so it does work anywhere. The wired barcode scanner scans Code11, Code39, Code93, Code32, Code128, Coda Bar, UPC-A, UPC-E, ISBN, EAN-8, EAN-13, JAN. EAN/UPC Add-on2/5 MSI/Plessey, Telepen and China Postal Code, Interleaved 2 of 5, Industrial 2 of 5 , and Matrix 2 of 5 but it can not do QR codes. So with a barcode scanner that can scan almost all barcodes your life will be so much easier so come check out this USB Barcode Scanner.